Portrait of Adrian by Ursula Orange ~ 1945. 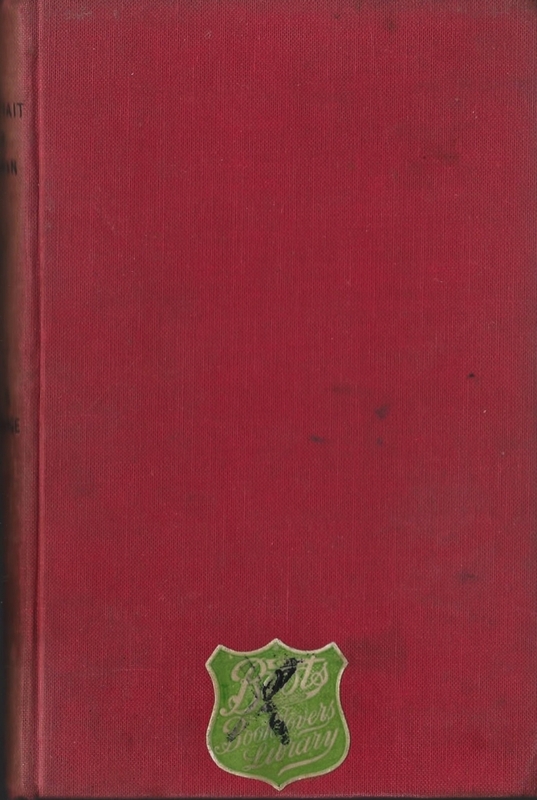 This edition: Michael Joseph, Ltd., 1945. Hardcover. 244 pages. When the letters of sympathy began to come in, shortly after Adrian Lessingham’s sudden and tragic death in a car accident, in the spring of 1939, his widow, Felicity, could not help wishing he could have read some of them himself. They would have amused him so. Hooked by this first tempting paragraph – and of course the fact that I had invested a respectable portion of my book budget for this scarce out-of-print book – I settled down with happy anticipation to this more than slightly satirical depiction of how appearances can sometimes differ from reality. For the most part, this optimism was rewarded, for the novel was pleasantly engaging; I never once had even the slightest impulse to lay it aside, not even when it became apparent that the author was leaning heavily on the “wonderful coincidence” technique when winding up her plot lines at the end. The book could indeed be otherwise titled “Portrait of Judith”, for widowed Felicity’s younger sister Judith, several years down from Cambridge and working as a receptionist-secretary concurrently with trying her wings as a fledgling writer, is the character most thoroughly revealed as the story develops mostly through her eyes. Judith and Felicity had known orphaned Adrian since childhood, when he had been absorbed into their family circle for school holidays and such. Judith in particular was emotionally close to Adrian in those juvenile and adolescent years, and the two shared a rich imaginative secret life of sorts, being involved with various arcane rituals and complex games, rules known only to the two of them. With adulthood gained, Adrian’s eyes turned to Felicity, serene and beautiful, and Judith, though quietly saddened by the defection of her childhood friend, was genuinely content with seeing her sister wed. The marriage of Adrian and Felicity symbolized to Judith the perfect union; she reveled in the thought that here was a completely successful match; true love personified. When her much-edited first novel, sent out with optimistic hope to publisher after publisher, persists in returning time after time, Judith is encouraged by her faithful but held-at-arm’s-length lover Clive to try her hand at another work. Perhaps a childhood memoir, he suggests, intrigued by Judith’s vivid descriptions of her youth, when she went about pretending to be a boy, and engaged in a complex but perfectly platonic relationship with Adrian. I’m rating this novel at a relatively conservative 7/10, because, while I definitely enjoyed it, I don’t think it quite matches up with the best of the other three of Ursula Orange’s novels which I’ve recently read, which was, in my opinion, Tom Tiddler’s Ground, 1941, a low-key but increasingly intense relationship drama set in the stressful early days of World War II. Tom Tiddler’s Ground was republished in March of this year by Dean Street Press in beautifully produced print-on-demand paperback and ebook format, along with Begin Again, 1936, an amusing “first novel” about four young women on the cusp of adulthood, and Company in the Evening, 1944, following a young divorced mother as she recreates her life after the breakdown of her marriage. All of these four novels share a warm charm, with realistically likeable/amusingly annoying heroines and side characters, full of very human quirks and foibles. The scenarios vary from deeply realistic to completely manufactured, sometimes progressing from one to the other in just a few pages. I suspect they filled the same niche at the time of their original publication as the better “chick lit” does today; engaging though not necessarily “literary ” reads for those (presumably mostly women) seeking bookish diversion and amusement. Read now, eight decades after their writing, these novels have a strong value as vividly detailed period pieces. Their characters remain relatable and amusing, and sometimes gloriously appalling. Good stuff for the better-light-fiction shelf. I sincerely hope that Dean Street Press is planning on republishing the elusive Portrait of Adrian, as well as the equally obscure To Sea in a Sieve (1937), and Have Your Cake (1942), to round out Ursula Orange’s small, six-novel body of work. Scott at Furrowed Middlebrow, what are the odds?